The north wind blows cold above the river’s mouth. Far and far beyond where Chuguo’s clouds end. Yearning for home, my tears have all run dry. A lone sail hovers between the sea and sky. What happened to the ferry? Where has it gone? The calm sea at sunset spreads on and on. 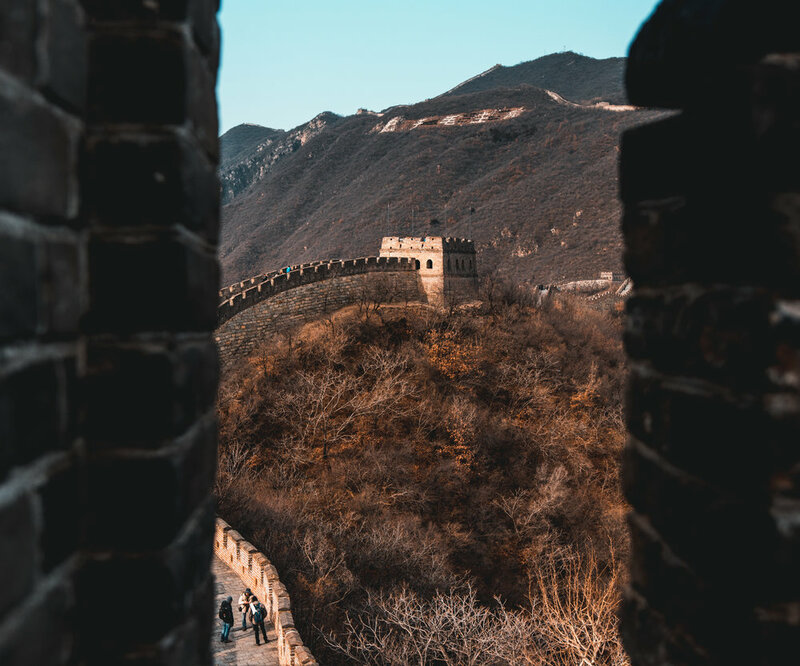 When I try to remember my first experience in China, I imagine the honks and screeches of cars bumper to bumper along seven-lane highways, the smell of cigarette smoke and factory pollution filtering into the air vents, and the yells of street vendors selling food and souvenirs. Skyscrapers line the cityscape to the point where downtown and suburb have no distinction. I picture crowds swarming around transportation hubs, and bicyclists ruthlessly riding by. I visited Beijing and Xi’an this past winter break, and my memories proved faithful. However, I couldn’t help but dream of China’s landscape 1,000 years ago, free from modern adulterations. I sought to capture the China described by the great Tang poets: one that is contemplative and simple. One where you can feel the Mongolian wind cut through the air, or hear the solitary footsteps along a worn path. Mutianyu houses a portion of The Great Wall about an hour and a half outside of Beijing. It lacks the crowds that typically accompany many tourist sites, and offers a snippet into the quiet, rural, and industrial life outside of big-city China. Visiting in winter was an interesting experience. Absent were the lush green trees or the cherry blossoms blooming in archetypal advertisements. Instead, I was greeted with a few lone tourists, an overcast sky, and stripped timber. With nothing else to do but experience a historical wonder, I decided to climb to the highest watchtower. I could’ve stood atop the watchtower for eons, admiring the sun rise and set, appreciating the silence pierced only by the wind. The mountains surrounding me rolled into the horizon like one could imagine scales on a dragon. I felt incredible awe and appreciation for the ingenuity of The Great Wall, but also for creating a bubble where I may travel back in time to encounter a former version China.